Nobody can describe WriteMyPapers better than our customers. You can tell your friends about WriteMyPapers.org and start earning money already today. This Program allows you to earn 10% on all your referrals, and your friends save 10% on their first orders. We look forward to meeting your friends, and you will get a reward for intruducing them to the service. Log in to your account or simply register. Find the referral discount code in your account. Tell your friends about our service and share the code. Your friends receive a 10% discount on their first order. 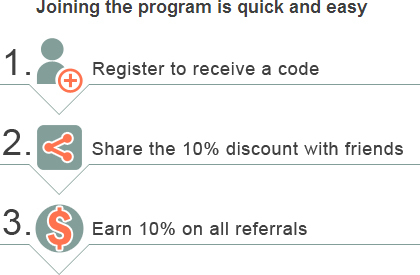 You get a 10% referral commission on all the orders! Will I be able to save 10% with the referral code as well? The discount code will work only for your friend. At the same time, you can always benefit from our discounts. Find the full list here. How many times will the code work for my friend? The referral code will give your friend a one time discount only. All his or her future orders can get a 5% or a 10% discount. You can find more information about our discount policy on this page. How can I track the amount of money earned? All the statistics is available in your personal account at WriteMyPapers.org in the section Referral Program. Simply log in to see the details. The process of withdrawing money is easy. Simply send your request to us at support@writemypapers.org not later than on 12th day of each month. Please note that it is only possible to withdraw $100 or more. You will receive your earnings between the 16th and the 20th day. You can get the money you earn to your PayPal, Webmoney or Skrill account.